Jim Alampi has spent his career leading companies, from a $325 million auto auction business (NASDAQ: IAAI) to a $1.5 billion chemical distribution business (NYSE: UVX). For the past twelve years he has helped entrepreneurs in the areas of leadership, strategy and execution. He has been a director on 20 Boards and has chaired four of them. 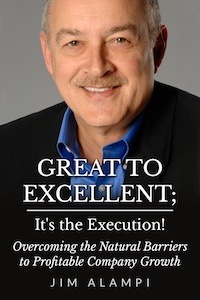 He created the proprietary methodology, The Execution Maximizer to help CEOs get from vision to execution and results.